At StickyJ Medical ID, our focus is on providing our customer’s with safety first. We recognize that in order to keep our customers safe, we need to ensure that you’ll want to wear the medical jewelry we offer. Because of this, we put a lot of time and effort into choosing medical ID’s that are trendy, attractive, and comfortable! Additionally, our medical jewelry is affordable and many of our most popular styles are well under $50 to purchase. Below is a list of our personal faves that make up our top five under fifty bucks! Gold Bolo Medical Bracelet for Women – This is a stunning bracelet and its extra comfortable due to its easy drawstring closure. Its minimalist style makes it an excellent alert ID for women of all ages. It retails for 29.99 and can be engraved on the front and back of its medical plaque with up to three lines of text. 2. Leather and Copper Stacked Medical ID Bracelet – The design of this leather bracelet maintains a stacked look on its own. Adorned with copper accents, this rather popular medical ID is a great choice for both men and women. Wear it any season with formal and casual looks. Costing just 34.99, this stylish medical ID is well worth purchasing. 3. Aluminum Medical Wallet Card in Black – This is the most affordable item in our list and it’s one of the most popular items in our entire shop! It’s a wonderful choice for anyone that has a lot of medical conditions, allergies, and or medications they need to list in one place. You can fit up to 8 lines of engraving on the front and up to ten lines on the back. This medical card is made of durable aluminum and cost just 2.99. The cost for engraving is 7.95 per side making this a very convenient and affordable option for medical IDs. 4. Medical Dog Tag Necklaces in a Variety of Bold Colors – These medical alert necklaces come with a matching silencer and are made up entirely of aluminum. Laser engraving is added to include your medical information on the front and back. These medical ID necklaces retail for 19.99 and are worth every penny to help maintain your safety. 5. Sterling Silver Medical ID Bracelet – If you love silver, this high polished medical bracelet is an affordable and attractive choice for you. It comes with a medical caduceus on the front and room for up to 5 lines of medical safety details on the back. This beautiful emergency ID is available for just 47.99! 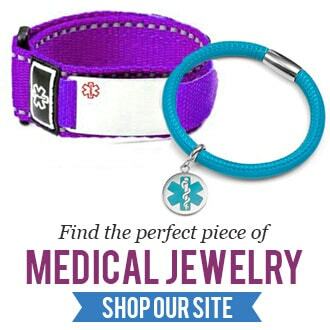 StickyJ Medical ID carries an extensive selection of medical alert jewelry for men, women, and children; visit our online shop today and find the perfect one for you!